It’s a day of Family First for me! Ben drove us to the city yesterday so I could finally have some decent internet connection. We’d planned a million things for the next few days but suddenly that’s all changed. Just as we arrived at our front gate we had a phone call to say that Ben’s mum was vomiting, confused and about to be transported by ambulance to hospital. And Rufous our young pup has taken a tumble and hurt his back leg, which now requires a vet visit. So last night and today and perhaps the days ahead for us will be family first. Ben’s mum is 92 and frail. I need to pop around to her home early this morning to clean. We need to take Rufous to the vet. We need to go up to the hospital. We need to be with our family. Hugs yours today, okay? Or give them a call. Whether they are blood-relatives or animal friends or people who’ve come to mean as much to you. We’re all each other has, and in the end, we’re all that matter. The Tawny Family Shows Off Baby! We have a family of Tawny Frogmouths that nest in the teak tree outside our kitchen window every year. They are nocturnal creatures, and seldom seen, so I always delight in having them in plain view. 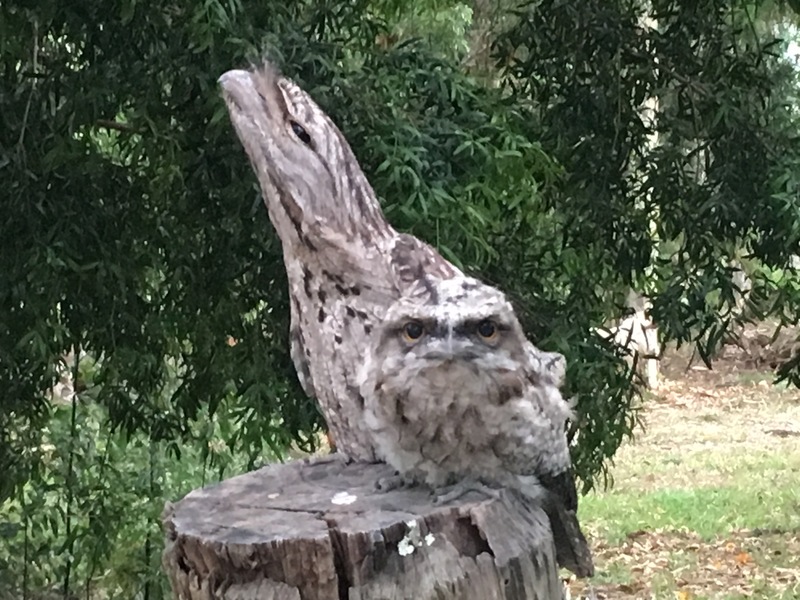 During the day Tawny Frogmouths camouflage themselves by lifting their heads, staying very still, and trying to pretend that they are part of a branch. Very cute, don’t you think? We kept an eye on her, and Mum and Dad came down to feed her each night until she was ready to fly back to a higher position. After another big storm here at the farm (that knocked out our power and internet for almost a day) we went for a walk and found Mum, Dad and the eldest baby perched on fence posts in the deep shade of the coolest corner of the house paddock. The oldest fledgling was up above, in one of the trees and I couldn’t get a good picture of them! The baby has gone from a little white ball of fluff to something that very closely resembles her adult plumage colours. She’s still adorably fluffy though, and I keep finding her soft downy feathers on the ground, which I’m keeping to make another talisman. Mum looks so cross with me for getting close, and I still kept my distance so as not to frighten them. That expression in her eye! They are a fine family, don’t you think? Apologies that the pictures are not especially crisp. They are taken on my iPhone from a distance, and my dodgy eyes are still not all that crisp themselves, making photography a little more of a challenge than usual. Still, I am making great progress with restoring my vision, and I’m hopeful that my sight will continue to improve. Hello, friends. Welcome to my Wednesday series on Death and Dying. This week, I’ll kick off the series by discussing some of my own first experiences of death. I’m choosing to start here because I see life and death quite differently to many people – and I always have. Perhaps this is because I am a psychic, and was born this way. Some of my knowing though, has happened by witnessing events that have thrown traditional views of life and death out the window – because these events have not supported the traditional views, and yet they happened. These events support my belief that life and the place that is beyond this current life we are living is something complex and beautiful. I believe that we continue to exist beyond this life. And I know that love goes on forever. We’re all going to die. Some of us soon. Some of us not for years. But none of us are getting out of this world alive. Death’s something we will all know, for our loved ones and for ourselves. I hope you find these experiences I share comforting. When I was a very small child I found life very confusing. I thought that we were all dead, actually. Or asleep. Trapped in a dream. Living in a fish bowl. Life didn’t seem quite real. I kept trying to make sense of it. Each night I went to bed and expected that I would wake up back in my proper place. My real life. Instead, each morning I would wake up and here I was. Still ‘alive’. But not the life that I remembered. The only comforting thing for me was that I also remembered other snippets of dreams (or being dead?) where I was living in a different time, and a different place, with mostly different people. I had several fragments of other dreams I had lived. They were as clear to me as movies, and the details never changed. In one of them I lived in a grand two-storey house made of stone, near an old castle. There was a big circular driveway for the carriages, and stables down behind the household gardens where all the horses lived. I had loved that place so much. I’d been very happy there. There was another place, or may it was the same place, where upside-down coracles were used as buildings. I remember walking to see them in the fields, and the wind being cold and sharp. I knew the word ‘coracle’ and I knew that it was a boat. Some funny people put their boats upside down and turned them into houses. I told my mum this and drew her a picture, but she told me I was being silly. Then she told me only fairies would live in a house like that, because it was imaginary. Fairies were imaginary too, my mum said. She’d only believed in them when she was little. Eventually I stopped sharing my ‘silly stories’. I knew, deep in my bones, that adults talking about death and being dead were wrong. Especially the ones who were frightened of death, or who believed that when you died there was nothing. That you just ceased to exist. No, I thought. That’s when you wake up again. That’s when you are home. These are strange thoughts for a child who has not yet gone to school, or watched television, or read books about bigger concepts of the world. Or gone to church. Image from www.contours.co.uk PS – Mum, see, people DO live in them and they are real!!! As an adult I have met other ‘strange children’ who have strong memories of previous lives or other times and places. You can click on the links to read the full story of each one. There was the baby who kept staring at me in a cafe. He and his parents were strangers, and I’d never spoken to them. This baby communicated psychically with me, and I was overwhelmed with a series of images of two very young boys – twins – on a farm. There was an accident with a gun and one boy died. That boy had now ‘come back’ as a baby to be with his brother. I shared the information with the father, who -after initially being very angry with me – confirmed all of my information. It was emotional and traumatic, but when the information was shared both the baby and the father became deeply peaceful. Then there was the little girl, Beth, who insisted that her mother bring her to see me. I had ‘seen’ this little girl before she was born, as a bright bubble of light in her mum’s aura. Beth’s mum had major fertility issues and had not expected to become pregnant, but then she did and Beth was born. I’d never met Beth, but she knew me straight away. And she had news. Her brother William was coming to be born too. Her brother who was always being her brother. Of course, some time later he did come. Kevin was a normal little boy until somewhere around the age of five, when he began screaming every time the family car drove under a long overpass or entered a tunnel. The first time this happened his hysteria was so severe that he actually passed out and needed to be taken to hospital. His mum brought him to see me after drugs and psychotherapy had failed to take away this little boy’s terror of tunnels. This wasn’t the only strange thing though. Kevin remembered very clearly being called ‘John’ and having another family with a different mummy. He also remembered how he had died in a previous life. A tunnel had collapsed during the London bombings when he was a little boy. His family had taken shelter there during an air raid. Kevin’s mum researched the things that Kevin told us during their session with me, and they checked out. Kevin had to be telling the truth. He was only five. How could he have made all of that up?